Update: postponed due to lack of ticket sales. New date to be arranged. 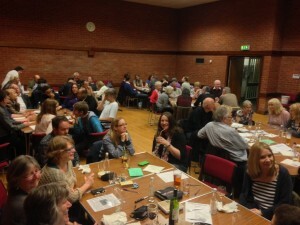 The Autumn Quiz Supper will be held at Pinner Village Hall, an excellent venue with ample parking and good accessibility. The supper on offer is pizza and salad — thanks to Pizza Hut who are again giving us a generous discount. Teams are of 8 to 12 but don’t worry if there are fewer of you than that as we will partner you with others in the same situation. Tickets will be available from the Centre priced £16, or £12 if you don’t want any food. Pinner Village Hall, Chapel Lane, Pinner, London HA5 1AA. There is access to the car park from Chapel Lane.